Creative Film Director, Social Activist, Environmentalist, Anti Corruption Crusader & Public Interest Litigant, Jawaharlal Shanmugam, our fire champion, is familiar in the court circles of Chennai where he’s seen almost every day! Shanmugam has been actively involved in hospital disaster management. Our team had an opportunity to get his insights on the same. In conversation with Jawaharlal Shanmugam, Team Beyond Carlton; managed to get some vital details on the recent major fire accident in Mumbai, the last month. Shanmugam has been in constant touch with the Government of Tamil Nadu on the progress of the norms and statuaries that can help bring about a change to help the evacuation process during fire accidents. 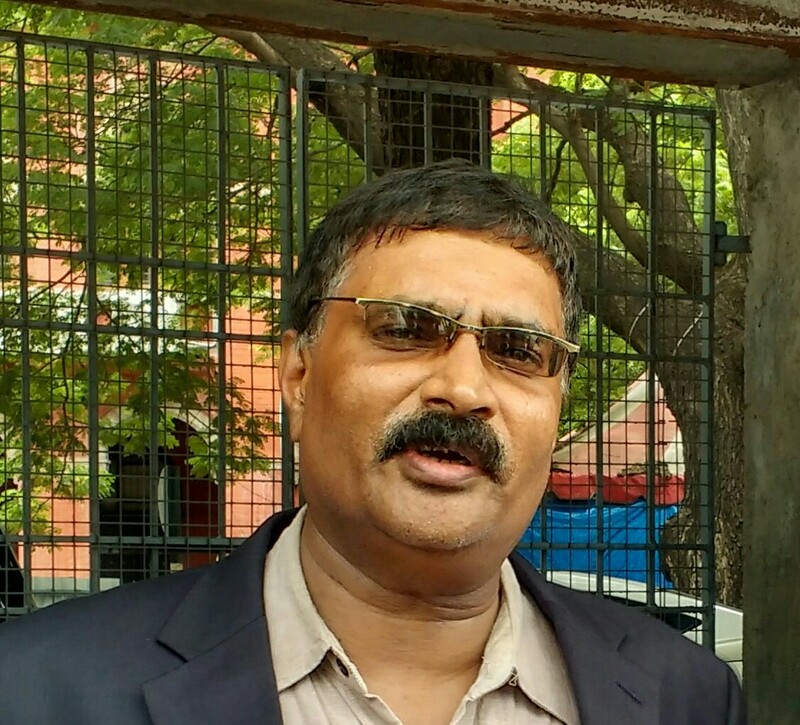 As part of his ongoing public interest litigation before the Madras High Court, the Hon’ble Bench of Court 1 (Court of the Hon’ble Chief Justice) requested Shanmugam to take an important role of an Expert Committee Member, to guide the Tamil Nadu Government to bring about a holistic solution to a very big issue concerning patient safety and people safety in a hospital environment. This is one of the rare cases, where the petitioner and the opponents in the case have come together to work out a plausible solution through effective participation of all stakeholders concerned. Thanks to the intervention of the Court. In the ongoing case on hospital disaster management that he has been fighting, one frequent thing that surfaces is the need for a ramp that will help speed up the evacuation process in case a building was to catch fire and the compliance to other statutory building rules and regulations. In the last year or so the State Expert Committee has met nine times, the team comprising of the dept of health and Family Welfare, relevant state Govt regulators, the medical fraternity represented by its association – IMA/AHPI/ State Medical Council, Central Govt organizations- The MCI and Commissioner of Disabilities, and Shanmugam, main petitioner along with another intervening petitioner. Probably, for the first time in the country, all hospitals in the state of Tamil Nadu are getting inspected. This is a Himalayan size exercise covering government and private hospitals totaling 5000 plus. What is the timeline of the inspection process? The main question that still is with a lot of people and the authority in charge is how to carry out the inspection process and how the timeline must go about. The basic guideline that entire country follows is called the ‘National Building Code of India’ and this is the code that the building authority gets when the planning permission process is made to go through. This code of building any structure has a very exhaustive list of norms and measures. All of the norms have some common norms abiding by the educational buildings, governments buildings, hospitals etc; and some of them are unique to each of the structure. A distance from a curb, property line, or structure within which building is prohibited. Setbacks are building restrictions imposed on property owners. This is the main thing that will eventually affect the fire fighting ability of the building. The setback area is mainly for the evacuation of people within and for the firefighters to have their fire tenders and other fire fighting vehicles parked to carrying out the activities during the time of distress. For any hospital above 17 meters to 30 meters in height, the setback space should be barrier-free for the Sky-lift cranes to maneuver easily. Ideally, it should be 7 meters on all sides with 9 meters at the bend. There are specific rules for installation of hydrants in the building interiors and exteriors. They play a crucial role in extinguishing the fire. The sprinklers- In a standard wet-pipe sprinkler system, each sprinkler activates independently when the predetermined heat level is reached. Thus, only sprinklers near the fire will operate, normally just one or two. A fire pump is a part of an internal and external hydrant system and powered by electric and diesel standby mode. They provide the necessary pressure to force water to reach the desired height and the force the required volume of water at high speed. Different types of portable fire extinguishers are installed based on the nature of fire, its classification and the area where it has to be installed. All of the above parameters depend, on a certain level, on the size of the building. It will definitely depend on the floors, the land area and so on! According to Shanmugam, 90% of our country’s buildings have ruthlessly violated the main code- Setback area! Sadly for the state of the population that we are at, we have lessened the amount of the setback area that affects the fire fighting abilities of any building in general. “As an expert committee member, I have inspected around 60 hospitals ranging from a small 20 beds to a large 2000 bedded medical college hospital,” says Shanmugam. Shanmugam has penned down reports on various hospitals and that has definitely received Government appreciation. What are the other disasters that affect the inspection parameters, other than the fire? Floods – When it is about the disaster management, on a larger picture, it is not just about the fire. Areas which are prone to floods- Like, in Chennai, you take a note of the flood too. There are hospitals besides the water bodies that had resulted into 17 patients of a renowned hospital due to hospital getting flooded and the hospital was without any type of power, thereby taking the precious lives of patients on a life support system, when Chennai had massive flooding in December 2015. Hospital blackout– When the main electrical cable gets into a short circuit or gets damaged; the entire hospital is bound to be in the dark. For multispecialty hospitals, going out of power can prove to be fatal for the patients on ventilators! Gaseous diffusions due to negligence – There can be a very dangerous gaseous leak in the hospital. The effluents too can just diffuse about the entire hospital. This can cause many patients to be prone to newer diseases, or just be prone to instant death. Bomb threat – Terrorist attacks are as unpredictable as any natural calamity. There can be terrorist attacks as well in the hospitals and even this need to be taken into account whilst inspecting all of the factors affecting the safety of any building. Rodents and serpent attacks – Hospitals are places that are full of blood-stained objects and exposed wounds. Rodents, serpents are always attracted more toward these, than normal buildings. In Chennai, most of the big hospitals are on agricultural lands that already have been infested with the snakes, rats, and rodents apart from other small animals! “The prime motive of disaster management in hospitals is about evacuation. How will a hospital evacuate its patients in times of crisis, is the main thing we see” says Shanmugam. What went wrong in the ESIC Hospital Mumbai fire tragedy that claimed 9? 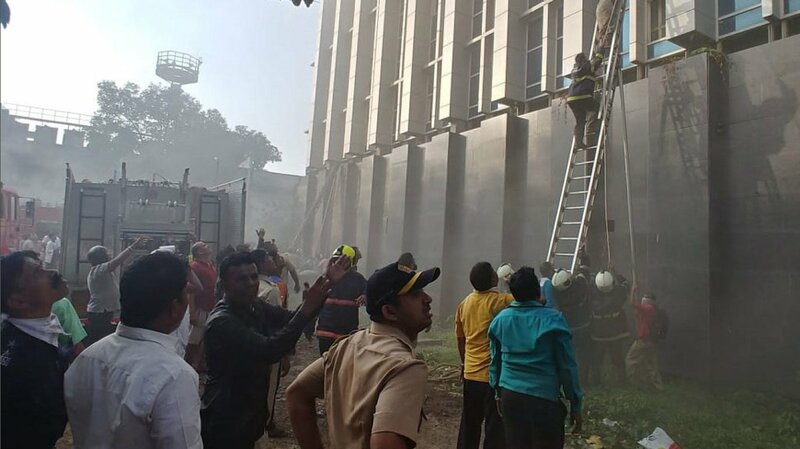 The ESIC hospital situated in Mumbai saw a major fire breakout that claimed the lives of 9 patients, on December 18th, 2018. From the visuals that were seen on the televisions, from the pictures of the hospital available; it makes one thing clear that the building DID NOT have proper setback areas. The area needed to evacuate people, to have the firefighters and the tanks placed; was comparably lesser than needed. It did not have adequate emergency staircases and the exit. Many people were climbing down the building from the 4th floor, with the help of the ladders. Two people also fell to their death because of the mismanagement of the building in having emergency exits intact. The worst that can happen during disasters is the mismanagement in the evacuation. The skepticism on having a ramp – If the hospital building had a ramp, this situation could have been averted. Ramps have become a very important part of the disaster management in hospitals and more so in India. The ideal size of any ramp width is 2.1 to 2.4 meters for the patient cot of 7 ft by 3 feet 5 inches to move freely. Also, the ramp should have a gradual slant/slope for the cots to come down without getting dragged. All inpatient cots should have wheels and not be static. Without wheels, the idea of the having a ramp itself gets defeated in purpose. The size and structure of the ramp depending on space availability. The glass-work for aesthetics – The recent development in building constructions are inclined more toward the glasswork for appearance. The classic example of smoke not leaving the building is the ESIC hospital. In the glass façade buildings, there is almost no escape for the smoke and all of it gets accumulated within the building. For a normal patient to gather energy to even leave the bed and run for life is a surreal situation. Are hospitals implementing the codes put by the inspecting committees? Many hospitals are willing to implement the changes told to them by the committee. This is the most heartening fact seen in the state. Many people have appreciated the case of Shanmugam. A lot of people aren’t aware of the norms, because the regulators did not pay a lot of heed toward the same. It is the duty of the regulators to educate and identify, and penalize violators, which sadly does not happen. In the case of Mumbai fire, the blame game continues. But the responsibility lies equally with the Government and the hospital authority in regulating the norms, and the implementation of the codes. “Every regulator should take the responsibility,” says Shanmugam. What are the main violations by a hospital, in general? Non-conformance to rules and regulations: Hospitals building occupied without valid Planning Permission or Completion Certificate. Many hospitals do not have Fire Compliance Certificate. Set-Back space: least respect and importance is given to this key factor. Basement and terrace – Many hospitals have cellars and underground areas housing generator room, air conditioning plant, stores, canteen, patient diagnostic rooms, consultation rooms, Central Sterile department, administration office etc. some of these activities are not permissible under the law and could be a potential source of fire accident and other disasters. Similarly, we find violation of terrace space. Hydrant Systems: many hospitals do not have the necessary hydrant systems as per NBCI norms. Use of unsafe false ceiling: When it is about the false ceiling, thermocol is the worst material to do so. A tiny spark and all of the false ceiling is on fire!. Rats have the ability to go into the false ceiling and they bite the electrical wire sleeve, leading to short circuit. Stationery items placed on the computer CPU – Many people have papers, books, covers on the CPU of the computers in the hospitals. CPU is all about heat and the papers catch fire because of the same. Keep stationery items like papers and cardboard out of the areas where it is exposed to heat. CPU and UPS should not be kept in a closed environment and should have proper ventilation. What kind of fire fighting mechanism can the hospitals have? Sprinklers – Sprinklers are a must in any building, and especially in sensitive areas like the hospitals. Adhere to the norms – All buildings should adhere to the codes, both externally and internally. No escape should be given to the hospitals to violate the setback area. There should be strict regulation for the area in front of and behind the hospital building. Proper hydrant systems and extinguishers should be in place – Fire extinguishers are the main things that people should look out for, whilst entering any building. These codes should be followed too! The electric apparatus and systems should be in constant check – The equipment, apparatus, boards and anything dealing with the electricity should be monitored on a regular basis. Inflammable articles should be avoided in the hospitals – Hospitals should not have curtains on the windows. Have sun proof films rather, is what the inspectors suggest! The provision of a ramp– It is the main thing and it should accommodate the bed dimension and not the stretcher measurements. The wards should be prepared to evacuate the patients with time in hand, with the help of the ramp. The beds should have wheels too. Basement activities should not be there – No violation of these laws should take place in any hospital. Basement could be used for parking activities only and with sprinkler system in place. Latest dry powder fireball – Works like a typical dry powder fire extinguisher. The ball is thrown into the fire and within seconds the fire is extinguished. Through a canon system, the balls could be fired to the area under fire. Drone systems to fight fire – For the places that are inaccessible for the firefighters, the drone mechanism can be used to put the fire at rest and start the evacuation process at ease. A high power drone can be fixed with the high-pressure water jets. Modern escape chutes: Inflatable chutes could be handy in any buildings devoid of other escape mechanisms. Easy to assemble and operate. Even sky lift cranes could be fitted with an escape chute for faster evacuation. Do you think people participate in the fire drills, with interest? Unfortunately, fire drills are not taken seriously. They are only done by the management for the record and not for promoting serious awareness amongst people. The fire extinguishers are usually devoid of the dry powder in many of the hospitals. They usually have expired as well, which results in the zero maintenance of the hospital. A lot of people do not know a lot of things regarding fire disasters and the vulnerabilities of the buildings they are in. At the same time, there are places where people are trained properly about the same, which is the brighter side of the current state of the awareness. It is heartening that this case has created an enormous awareness in the minds of people. Now they are forced to look into the issue seriously and have started understanding the importance of many safety norms. The NBC code of India should be constantly amended to address the modern architectural trends in order to fight the fire. Are people nonchalant about their own safety? It is not just about people, but about the management as well. Even the authority is nonchalant and ignorant about the safety of the patients, over anything else. People are only concerned with profiteering or using the available space to the maximum benefit, thereby, compromising on safety aspects! Corruption also favors disasters. Have you faced a lot of backlash in the cases that he is fighting? Even the opponents know that he is fighting for a genuine cause. The courts have also given him favorable verdicts and orders, thereby, giving due respect to the case and the petitioner. Well, there is always a threat to his life as some of his cases have targeted the mighty, having enormous political clout and power. Any favorable order given by the High Court or National Green Tribunal, the mighty opponents take the case to the next level for an appeal. However, Shanmugam is not worried about these and with a single-minded devotion has been relentlessly fighting. No doubt patience and perseverance get tested to the hilt. What has motivated him to take up this role? In India, there is no respect for statutory rules & regulations. There is a rampant violation due to corruption. The elite & influential use their political influence, money & muscle to amass wealth through violation & illegal means. The root cause for all problems in this country is the corrupt mindset that has percolated in our body & it has become a vital DNA. The common man suffers & the country suffers to a large extent in its growth & development. Shanmugam also opines that the public should come forward and question the government if they are not acting as per mandated responsibilities. Media, being the fourth pillar of democracy, plays a crucial role in sensitizing the issues. Sometimes, they bring it to the knowledge of the government and the court on serious issues. In order to be a public litigant and activist, Shanmugam chose to leave his high-paying job.